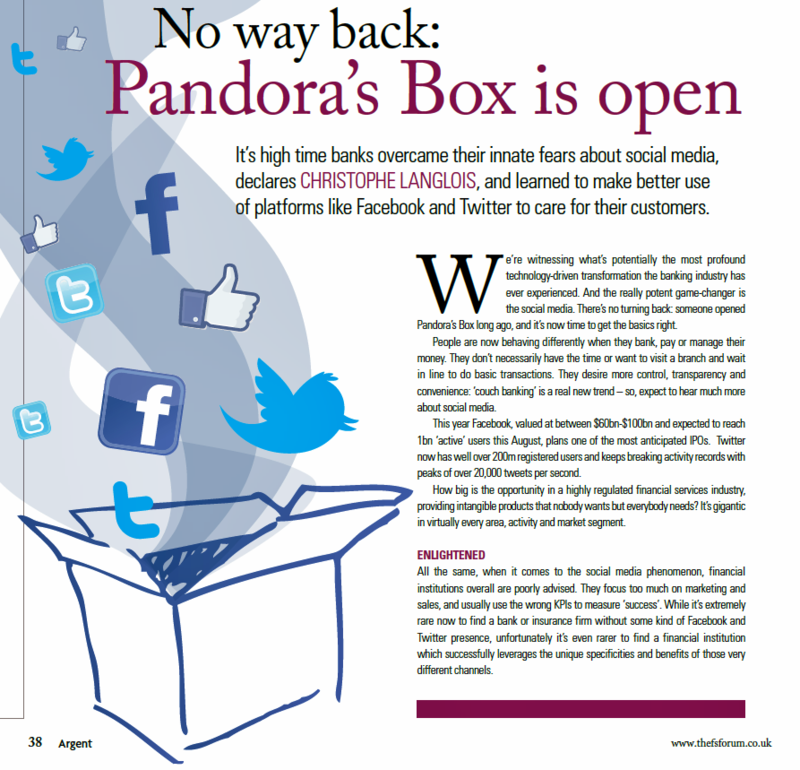 Home Social Business Social Customer Care: No Way Back. Pandora’s Box is Open. In a recent guest article for an industry leading magazine in the UK, I share my vision on social customer care, including twitter and facebook, and its importance to the financial services industry. Pandora’s box is open. There is no way back. Since I launched Visible Banking five years ago, I’ve been regularly invited to write articles and share my views on social media and digital engagement in financial services in industry leading publications. A few weeks ago, I wrote an article for ARGENT, the magazine of the Financial Services Forum, where I shared my views on one of my favourite topics, social customer care. Since Q4 2011, my team has been closely tracking over 250 twitter accounts dedicated to customer support, all across industries, all over the world. This benchmark gives us some unique insights to help our clients launch a best-of-breed account with the right design, team structure, content strategy (syntax and call to action), internal processes, from the get go, It also enable us to identify quick wins, coach your team, and make some immediately actionable recommendations to take your existing account to the next level. I invite you to read an extract of my article. Dont be afraid to open up, but do recognise there are risks: so, beprepared to minimize the overall vulnerability by posting clear user guidelines whilst checking the page regularly. Moderate it whenever you see fit, butdont get rid of relevant criticisms and negative feedback. Main account: most brands start supporting their clients via their official corporate account. Australias UBank does a good job on Twitter with its multi-purpose account. Dedicated account: creating a customer care account is an efficient way to make a statement and demonstrate your recognition of Twitter as a channel to engage with your clients. American Express does a great job with @AskAmex. I hope you enjoyed reading this short extract. I believe the Financial Services Forum will start shipping the magazine by the end of the week. If you are not subscribing yet, I invite you to fill this form to receive a sample issue. If you are working at a financial institution, we would be delighted to send you a pdf version of my article. Please send us an email toEnquiries@Visible-Banking.com. We believe we are in a unique position to help you better leverage twitter and differentiate yourself from your own competitors which are very likely to be on twitter but drive little engagement on the popular microblogging service. Indeed a few months ago, we announced that 90% of the twitter accounts in financial services were not active… Contact us today. Previous articleBanks Must Have a Social Media Presence. Period.